::edit:: Guess what! River’s back, if just for one post, and she’s hosting an amazing giveaway: The Healthy Chef 4-in-1. If I had any money, I’d totally buy this, I mean, a rice cooker, steamer, yogurt maker, and dehydrator all in one appliance? Awesome! Anyways, go enter the contest, maybe you’ll win! So remember how I promised more millet recipes? Well, this one proved that millet isn’t just for the birds (or rats, since it was the base of my rats’ food…)! I don’t know how many of you guys check out The Kitchn by Apartment Therapy on a regular basis, but it’s a really swell inspiration site (and a good read). A few weeks ago they posted Picnic King’s Whole Wheat Sesame Millet Bread and called it the “the perfect one slice sandwich bread.” No joke, the bread is perfect–and perfectly easy! I love how simple the recipe is–the perfet lazy day Saturday baking adventure–and the end result is well worth the time. I’ve had issues in the past with proofing, but given the constant 80 degree temperature of my AC-less apartment in the South, proofing ain’t no problem no more! Seriously, the yeast loves me. I’m not really digging turning on my oven, but if it gives me fresh bread for a week, so be it. The recipe made one loaf and one small boule for me, although I could have free-formed it into one larger loaf. The bread is sweet and nutty with a perfectly dense, but not too dense, crumb and I love the extra crunch of the millet and sesame seeds. I haven’t used it for a sandwich yet, just for soup, but I can’t wait to lather and layer it up and see how it holds! Add the honey to the hot water in a small bowl and stirl. Add the yeast and allow it to sit at least 10 minutes until it is frothy. Meanwhile, toast the sesame seeds over medium high in a small frying pan until the seeds are golden brown. Remove them from heat and allow to cool. In a mixing bowl, mix the flours, salt, millet, and cooled sesame seeds. Pour the yeast mixture in and stir together until it forms a dough. Transfer to a floured surface and knead, adding a little bit of bread flour at a time, until a slightly sticky dough forms. This will take about 10 minutes. (Or you can use a bread hook on a mixer for 5-7 minutes). Place the dough in a well-oiled bowl, cover with a towel, and leave to proof in a warm place (I use the inside of my turned-off oven) for 1 hour, or until doubled in size. After the dough has doubled in size, punch it down and shape it into one large free-form loaf or two smaller loaves or boules. Cover again with the towel and let proof in a warm spot for another 30 minutes. After 30 minutes has passed, preheat the oven to 400. Bake the loaf/loaves for 20-40 minutes, until golden brown on top and darker brown on the bottom. The loaf will also make a hollow sound when rapped on top with your knuckles. Let cool on a baking rack, then enjoy! Yum! I love millet! I’m saving this recipe for my next bread baking adventure. I’ve only baked with millet once. I made oatmeal bars and replaced a little bit of the oats with toasted millet. They came out good, I liked the crunch the millet added. millet = yay! dan & i love the stuff! i love that it can be kinda like couscous and that it can be all creamy like polenta, too! mmmmmmmm! i have never checked out the kitchn on apt. therapy, but i must now – i usually just check out their “green” section. 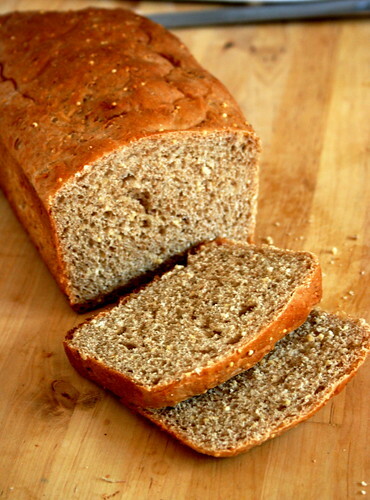 when my ACT is over i am so going to make your whole wheat sesame millet bread! thanks, Jes! you = the best! w00t! this bread sounds so amazing! i have never made a real sandwich bread before and i’ve been looking for a good recipe. thanks! Wow, that’s on my list! Amazing Jes! I look forward to trying this..I am trying to follow your good example to clean out my pantry to save a few dollars right now. So that’s so inspiring me! I just checked out your thesis and wanted to say bravo! What an interesting topic – nature writing is an area that I’d love to explore more in a future life (so many books, so little time). Our university (University of Alaska Anchorage) has an annual conference in March that I think you should consider presenting at, especially since our themes this year are memory, history, and culture. Shoot me an email sometime if you’re interested and I can send you more info. That bread looks fabulous! I’m really into baking right now, so I should put it on the list! I make muffins with millet in them and I love them, so I can’t wait to bake this bread! I must try this! I’m a huge millet fan. Beautiful soup, Jes. Simple ingredients that marry well. What a great lunch paired with homemade bread – you rock!